Olivia Ambrose, the 23-year-old woman whose disappearance outside a downtown bar Saturday night prompted an intense, citywide search, was found Tuesday in Charlestown, and a man was arrested in connection with her alleged abduction, Boston police said. The discovery of Ambrose followed high-profile pleas for help from her family and friends. “Today is a good day. Ms. Ambrose was found alive,” Police Commissioner William G. Gross said Tuesday evening. The suspect, Victor Pena, 38, is facing a charge of kidnapping, and is to be arraigned Wednesday in Charlestown Municipal Court, authorities said. He has had multiple run-ins with MBTA transit police over the years, officials said, including twice for allegedly menacing interactions with women. Gross said at a news conference that the surveillance video showed Pena guiding, holding, and “clutching” Ambrose on the street late Saturday night. “It’s obvious from the video surveillance that she did not go along willingly,” he said. Her family reported her missing to Boston police on 5:20 p.m. Sunday. The investigation led police to Pena’s apartment at the Bunker Hill public housing complex on Walford Way Tuesday. Police repeatedly knocked on the door and eventually “the suspect opened the door and we observed the victim,” Gross said. “She appears to be in good health. But as to state of mind, I cannot attest to what state of mind” Ambrose was in, Gross said. He said police had still not interviewed her. Gross said investigators were still looking to determine “exactly how she was being held” and if she had been threatened with violence. He said Pena’s motive for the alleged kidnapping was not known. Ambrose had vanished after leaving Hennessy’s, a bar near Faneuil Hall. The news that she had been found and a suspect had been arrested came soon after police Tuesday afternoon had released photos of a man they described as a “person of interest” in her disappearance. Police also released a detailed timeline of events surrounding the disappearance of Ambrose, who had recently moved to Jamaica Plain. 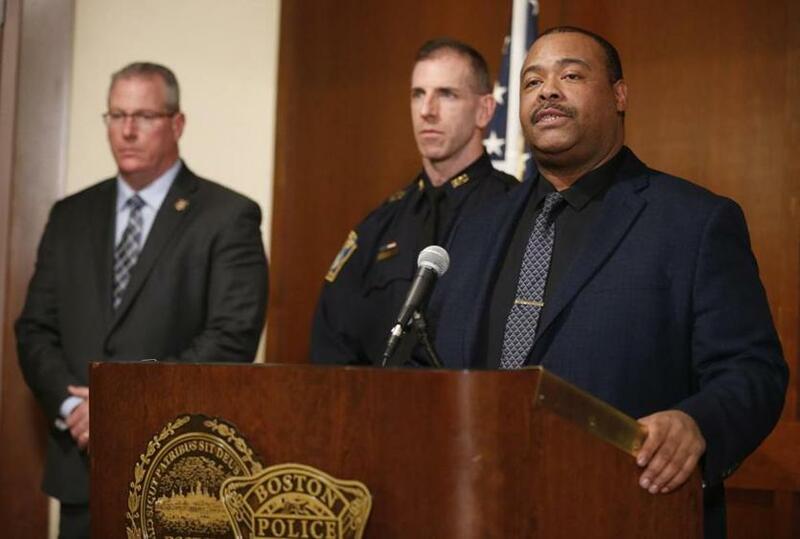 Boston Police Commissioner William Gross spoke Tuesday about the case. At 11:04 p.m. Saturday, Ambrose was seen leaving Hennessy’s with a man who was not involved in her disappearance, police said. Additional surveillance footage from 12:01 a.m. Sunday captured “Ms. Ambrose being accompanied by that same male, still with his arm around her, exiting the Bunker Hill Community MBTA Station in Charlestown,” the release said. At that point, the second man is not in the video. Ambrose and the man were spotted on video little more than 10 minutes later. Her phone records indicated she was near the Bunker Hill Housing Development. Investigators still want to find the other man who was captured on the surveillance video at one point with both Pena and Ambrose, to determine whether he is a suspect or a witness, Gross said. Police have not yet determined if Pena has a criminal record, Gross said. But he is known to transit police. In an April 2009 incident, a woman told police that she was at Downtown Crossing when Pena began staring suggestively at her, according to an official with knowledge of his record. She got on the train and he followed her, sitting across from her. The woman said she thought he was trying to look up her skirt. The woman got off the train at Back Bay, and Pena followed her. She told a customer service agent she needed help, and even after the agent called police Pena remained at the station, staring and pacing. When police arrived, the official said, Pena said he did not speak English. When a Spanish-speaking officer arrived, Pena claimed the woman appeared afraid and he had only been trying to ask her why she was scared. Officers did not arrest Pena that day. They checked him for warrants, found none, and ejected him from the station. A man who identified himself as a friend of Pena then approached police and told them that Pena was known to follow young girls, and had mental health issues. A week later, another transit police officer saw Pena at State Street Station pacing around and looking back and forth, the official said. Despite there being many open seats, Pena sat down directly next to two young girls. The transit officer walked over to ask what he was doing, and the girls said they did not know him. The officer told Pena to leave the station. 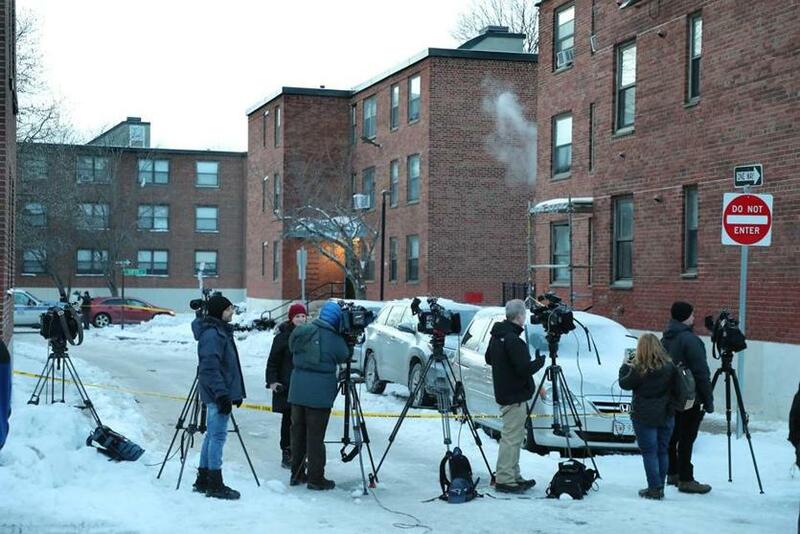 Media members were at the housing complex where Boston police arrested Victor Pena. A city official said that Pena has lived at the Charlestown housing complex for 10 years. He is on Social Security disability, but does not have a physical disability. He has no record of problems there, the official said. At the news conference, Gross thanked the transit police, the Boston Housing Authority Police, the public, the Ambrose family, and the media for helping with the investigation. “Great teamwork today. The entire village turned out for this one,” he said. Ambrose’s twin sister, Franny Ambrose, said Monday that she and Olivia, along with some friends, had gone to Hennessy’s to see a rock band that was performing Saturday night, but left the bar separately. Franny Ambrose reported Olivia Ambrose missing Sunday when she didn’t answer phone calls. Pena’s arrest turned the red-brick housing complex in the shadow of the Tobin Bridge into a crime scene on a frigid winter afternoon. A stretch of Walford Way in Charlestown was cordoned off with yellow police tape late Tuesday afternoon. A trio of police vehicles idled on nearby Tufts Street. Neighbors said they had recognized the man in the photos released by police, and they had been concerned about his behavior. Magaly Galvis, 47, said that last week, the man was staring at her 14-year-old daughter and making noises from his residence. “I just ran home because I didn’t know what he was going to do,” the girl said. Last year, Magaly said, she and her daughter were walking with friends in the neighborhood when the man started to follow them on his bike. The group tried to walk in the other direction from him several times, Magaly said, but the man kept turning around to follow them while mumbling. Palvis Alvarez, 28, who lives just up the street from Pena, said that one night he started to catcall her and get close to her when she got off work late and parked in front of his house. Alvarez said it’s the “biggest, greatest news” that Ambrose was found alive. Gaeton Delice, a 37-year-old nurse’s assistant and single father to two young boys, has lived in Charlestown for three years. According to her LinkedIn profile, Ambrose attended the University of Edinburgh and works as a project coordinator at Toast Inc., a Boston-based company that sells point-of-sale and restaurant management software. Evan Allen, Travis Andersen, Mike Bello, Maria Cramer, Emily Sweeney, and Adrian Walker of the Globe staff, and correspondents Abigail Feldman, Breanne Kovatch, and Andrew Stanton contributed to this report.